United States: Peace Broker or War Monger? On Friday, 14th September 2018 I was among the audience who were invited by Institute of Business Administration (IBA) Karachi to a talk led by Dr. Moeed Yusuf, Associate Vice President, Asia Centre, United States Ins­t­itute of Peace. The other two worthy speakers were former Defence Secretary of Pakistan (Rtd) Lt. Gen. Tariq Waseem Ghazi and former Chairman of Pakistan Nuclear Regu­l­atory Authority, Jams­hed Hashmi. Dr. Yusuf spoke about his latest book ‘Brokering Peace in Nuclear Environments: U.S. Crisis Manage­ment in South Asia’, in which he studied environments where nuclear weapons were present which changed the dynamics of any crisis. He also proposed the theory of ‘brokering of peace,’ and crisis management in the regional nuclear environment of Pakistan and India. Having listened to the worthy speakers, a question came to my mind, is the US a peacekeeper or a warmonger? Concerning Pakistan, I am witness to many frustrating experiences with the US. Some of these include unwillingness of the strongest superpower to mediate in the resolution of Kashmir issue, which is often termed flash point. The superpower didn’t play any role in stopping East Pakistan becoming Bangladesh. The US first used Pakistan along with Taliban to fight USSR troops in Afghanistan and post 9/11 Pakistan was used against the Taliban. Over the years ‘do more’ mantra continues. Now Afghans have been brainwashed to a level where they consider Pakistan, a foe rather than a friend. During the cold war era, India was provided military hardware by the US to equip it to fight against China. The US also facilitated India to attain the status of a regional superpower. The program has been further accelerated after the commencement of work on China Pakistan Economic Corridor (CPEC). The relationship between Iran and India are being supported to counter relationship between Saudi Arabia and Pakistan. A closer look in the neighborhood shows proxy wars going on in Afghanistan, Iraq, Syria, Yemen, and Lebanon for years. Based on Pakistan experience and ongoing US proxy wars in the region, one is forced to conclude that the US is not a peacekeeper but warmonger. Having said this, I would like to thank Dr. Moeed for providing an opportunity to the newly elected government of Pakistan to understand the paradigm shift in US foreign policy, imposing itself as a peace broker on Pakistan and India. 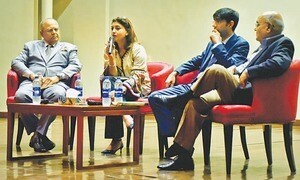 My suggestion to the Indian government is also to engage with Pakistan directly, rather than asking the US to mediate.